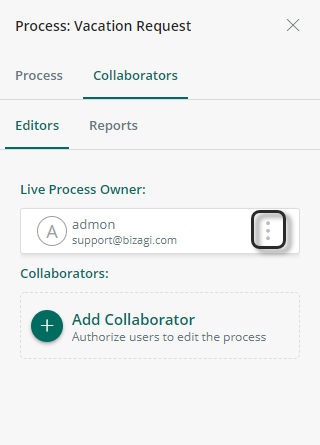 When you create a new process, Bizagi assigns you as owner. This gives you the ability to invite other users to participate in the making of your process as collaborators. 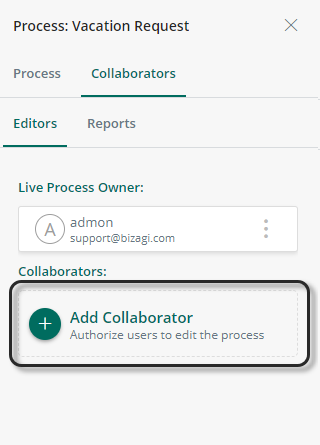 Users who are collaborators, owners of a process, have the role of BA Administrator or are the Admin user (admon) all see their processes on their dashboard. There are two roles a user can have when a Live process is shared: owner and collaborator. The process owner is the process creator by default, though other users can be assigned as owners. Since there is only one owner per process, if a new owner is selected the previous owner becomes as collaborator. The owner has the power to delete the process's draft or pilot versions, work on the process, assign a new owner and add and delete collaborators. BA Administrator role and the domain/admin user have owner privileges on all Live Processes. Process collaborators have editing permissions on the processes they have access to. These permissions are the same as for a process owner. However, collaborators are not allowed to delete the process, add new collaborators or assign a new process owner. They can, however, delete themselves from the collaborators list. 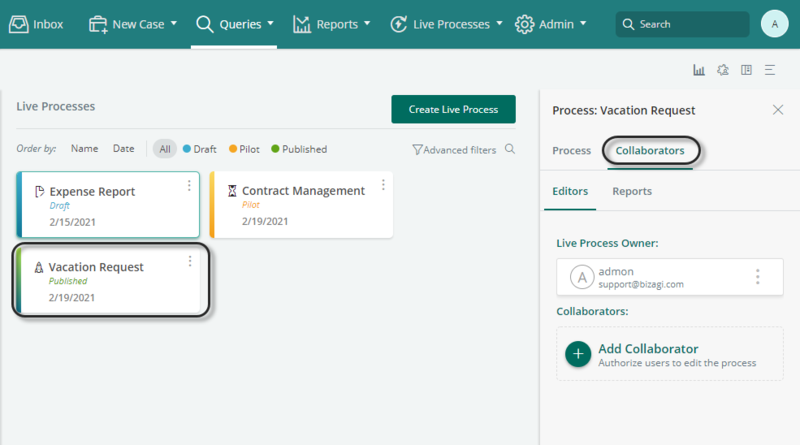 On the Manage Process dashboard, select the process you wish to add a collaborator to and select the Collaborators tab. Click Add Collaborator, select the search bar and start typing name of the user you wish to add as a collaborator. 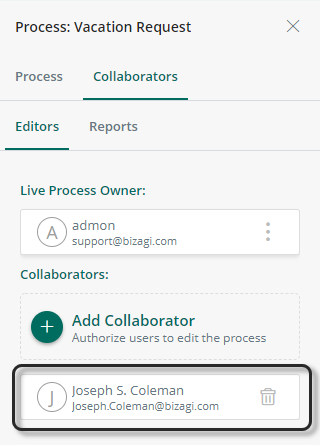 Click the name of the user you want, and they will be added to the collaborator list. To assign a new owner click the three dot menu, and search for the user you wish to assign as the new owner. Click their name. Bizagi shows a confirmation dialog, click Accept. The previous owner will be listed as a collaborator and the new owner appears as owner. If the new owner was a collaborator, their name disappears from the Collaborators list. To delete a collaborator, click the trash icon beside their name and they will be removed from the Collaborators list.